Any number of fillings and flavors could become favorite no-waste treats. 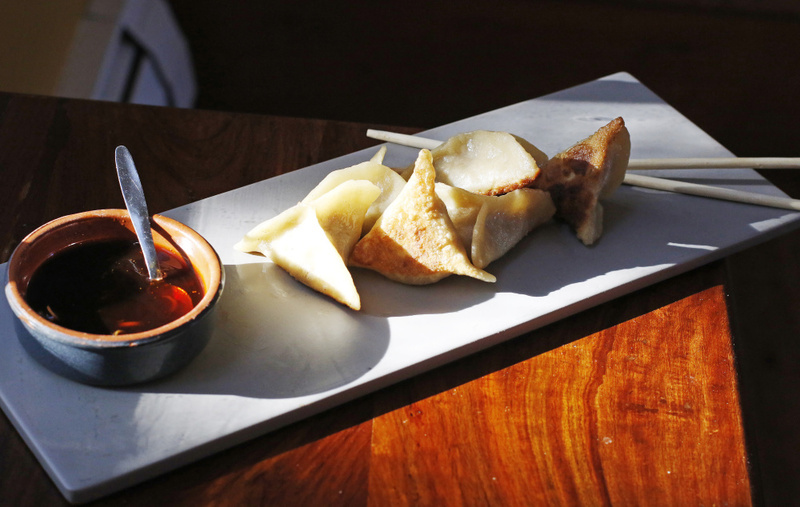 Filled dumplings are a cross-cultural waste-not-want-not culinary wonder. Most gastronomic traditions have them on the menu, whether they are called pierogi, ravioli, potstickers, maultaschensuppe, momos, khinkali qvelit, kreplach, wontons, buuz, manti, pelmini, samosa, gyoza, jiaozi, runsas, tiropitakia, mandu, kroppkakor, pelmeni, pastelle or coxinhas. The author demonstrates how to fold a three-cornered dumpling. Be vigilant about the seal so the dumpling doesn’t split open during cooking. Pour flour into the bowl of a food processor. With the machine running add water in a steady stream. As soon as all the water has been added, stop the machine and check the dough. It should look rough and feel soft but hold its shape when pinched. If necessary, add water by the teaspoon or flour by the tablespoon to get this consistency. When you get the right texture, run the machine for another 5 to 10 seconds to further knead the dough so that it forms a ball around the blade. Transfer the dough to a clean work surface and knead it with the heel of your hand for about 30 seconds until the dough is smooth and slowly bounces back when you poke it with your finger. Wrap the dough tightly and let it rest at room temperature for at least 15 minutes but up to 2 hours. When the dough has rested it becomes earlobe soft, which makes wrappers easy to work with. Fill a small bowl with warm water. Dust a sheet tray with flour. Keep both near your work area. Transfer the dough to a work surface that has been lightly dusted with flour. Slice the dough into thirds. Cover two pieces with a damp towel. Roll the third piece into a log 1 inch in diameter. Cut the log into 12 to 15 small rounds, each weighing about half an ounce. Dust each piece of dough with flour. Dust the working surface again. Take one dough round and press it into a disc with your hand. Use a rolling pin to roll the wrapper into a 2-inch circle, with the edges being thinner than the middle. It is OK if the wrapper is not perfectly round. 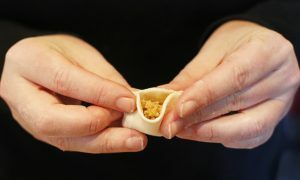 Hold the wrapper flat in your hand, place a heaping teaspoon of dumpling filling in the center of the wrapper. Dip your finger into the bowl of warm water and rub a bit of water all the way around the wrapper. Close your hand a bit to form a taco shape and start pinching one end of the wrapper to seal, heading towards the middle. When you’re just about halfway toward the middle, use your index finger to bring the far outside edge of the other side of the wrapper to meet the pressed seam, forming a three-cornered pouch. Using your thumb, middle and index fingers, pinch the three seams of your triangle dumpling to make sure it’s sealed. Place the folded dumpling on the prepared sheet pan and repeat until all the dough rounds are filled and folded. Repeat entire sequence with each of the remaining pieces of dough. Freeze the dumplings individually on the pan. Once they are frozen you can consolidate them in a labeled container in the freezer. To cook from frozen, heat a tablespoon of oil in a seasoned skillet over medium high heat. When oil is hot, place dumplings in the skillet, pleat side up. Cook for two minutes so that the flat side of the dumplings brown and crisp just a bit. Pour 2 tablespoons water into the skillet, cover immediately, and turn the heat to medium. Cook covered until the water is evaporated and dumplings are warmed through, 3 to 4 minutes. Dumplings are cheap staple foods made up of a simple dough and flavorful fillings. They get assembled en masse, frozen and then are boiled, steamed or pan-fried any time a tummy grumbles or extra guests arrive for dinner. And they are a great way to dispatch the bits and bobs in your refrigerator to create something much tastier than compost. Sustainability-minded cooks can fit dumplings into their rotation of use-it-or-lose-it techniques alongside clean-out-the-fridge pasta sauce, spare vegetable frittatas and creatively topped pizzas. But as with all of these practices, cooks must be open to the distinct possibility that replicating a particularly good batch of dumplings in the future might be impossible because the combination of ingredients – say half a red onion, four frozen shrimp, a spare sausage link, a shredded carrot, two tablespoons kimchi and the last bit of fresh ginger – may never be on hand in the same quantities again. I regularly line up for lunch at Bao Bao in Portland, where Chef Cara Stadler is very precise with her dumplings’ flavor profiles (the lamb, black bean and chili are my personal favorite). At home, I fill all kinds of dumplings with all kinds of things. Typically I run with Asian-like ones because I keep flavor-boosting condiments like hoisin, sriracha, black vinegar and sesame oil in the pantry to make the filling pop against the dumplings’ neutral dough. That said, if you’re blessed with your Babushka’s pierogi dough recipe or your Nonna’s fresh pasta know-how, these no-food-waste dumpling guidelines still apply. You’ll just adjust them to the taste profile of your heritage accordingly. Making your own dough (see recipe) is a rewarding, albeit time-consuming, process that gets shorter with each extra set of hands you can rally. But if you’ve only got two hands and need a quick fix, do yourself a favor and buy round dumpling wrappers in the frozen section of most Asian grocery stores. You can include any ingredient you want in a dumpling filling, but it’s best to combine them all in a food processor so there aren’t any big chunks of any particular ingredient dominating any one dumpling. One cup of filling will make 12 to 15 dumplings. Pre-cook any animal protein you want to include in the filling. This step means you can taste the filling safely before wrapping it in dough to make sure you like it, and it helps prevent any food safety issues down the line. Use either raw or cooked vegetables based on what your leftovers look like, but none should be watery, as you don’t want the filling to weep out of the seams or make the dough soggy. If yours spreads out at all on a spoon, add bread crumbs a tablespoon at a time until it holds together. Make sure the flavor of the filling really pops so the finished dumplings aren’t bland. My favorite flavor-boosting combination includes one teaspoon each of something sweet (hoisin, honey, brown sugar), sour (citrus, vinegar), pungent (minced garlic, ginger) and a liquid spice (hot sauce). Be diligent about your dumplings’ seal. A busted dumpling is a bummer. Not as bad as food waste, mind you, but not as neat and tidy as creatively cleaning out the fridge can be.